AzCSNHP is headquartered in Phoenix, AZ. Our goal is to provide education and resources to organizations and individuals who are in support of a universal health plan in the US. 1. The on-going medical costs of the tort will not have to be covered; 2. The continuing primary doctor/ patient relationship built on trust, friendship, a long term relationship, and even love will reduce the tendency to sue every time the outcome does not meet the expectations of the patient; and 3. Under single payer, one set of standards for care will be promulgated -- providers who demonstrate that they practiced within the standards will not be sued because no lawyer would challenge the standards that have been universally developed with both patient and medical, clinical and scientific, inputs. In dog years, one year is a long time. But in research year, data never gets old, it just gets augmented with more data in the future, to compare changes in whatever is being measured. 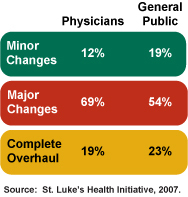 In 2007, St. Luke's Health Initiatives published a comprehensive study about physician's attitudes toward the current health system. The table below show that for the first time, the majority of Arizona physicians see a need for a major change in the health care system in the U.S. The general public falls close behind. Read the complete study results. The following is the testimony that Dr. Margaret Flowers presented to the National Commission on Fiscal Responsibility and Reform at its June 30 hearing in Washington. Dr. Flowers is congressional fellow for Physicians for a National Health Program. August 15, 1932 - June 28, 2010 Philip Nickerson James died peacefully of natural causes in Sun City, Arizona. He is survived by his sons: Greg and Larry; and his grandchildren: Chris and Jill. Dr. James was a graduate of MIT and held a PhD in Organic Chemistry from the University of Illinois. He married the love of his life, Barbara Fagan James, in 1954. After working as an executive leader in academia, industry, and government for over 40 years, Phil and Barbara retired and toured America in their motor home. They were both concerned about the plight of those people who lacked health care, and they were members of The Arizona Coalition for a State and National Health Plan for many years. Phil’s intelligent contributions, and his integrity will be sorely missed. Our condolences go out to his family. Family and friends are encouraged to share memories and condolences by visiting the online obituary Guest Book at www.obits.azcentral.com. Phil Lopes HB 2188, Health Security Act, introduced in the Arizona State Legislature on January 20, 2009. Link: Click here to read the text of the bill. HR 676 was re-introduced in the 111th Congress on January 26, 2009.